The red and white faithful cheering on the Sydney Swans. The Sydney Swans are set to return to Marvel Stadium on the weekend. 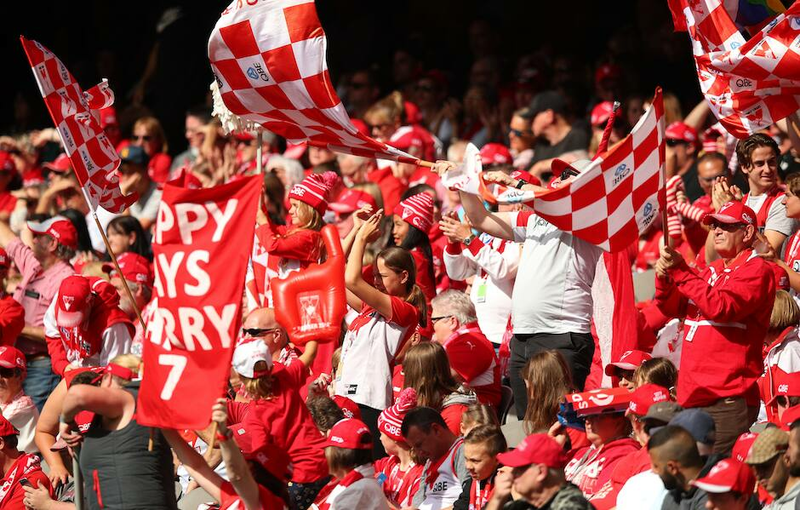 Plan your trip in advance and join Swans fans in the stands on Saturday night as Sydney looks to bounce back against Richmond. It’s set to be a big crowd, and members are advised to arrive early to enter General Admission (Level 3), or upgrade to a reserved seat in advance. Reserved-seat upgrades can be purchased via Ticketmaster. If you would like to sit among other Swans members at the match, click HERE. You will need to select the ‘Away Area’ option and enter the 12-digit barcode on your membership card. Additional fees apply. VIC AFL Platinum members wishing to sit in the AFL Members Reserve will need to upgrade to a reserved seat via Ticketmaster. Reserved-seat upgrades cost $9.50* for adults. General-public tickets are also on sale via Ticketmaster. We recommend purchasing your tickets in advance of match day to lock in a great seat! Join the team in 2019. With three massive games left to play in Melbourne, we’d love to have your support as a member. Victorian adult memberships start from just $88. Click HERE to find out more. *Prices exclude any booking fees.